You’ll be grateful for our Thank You card maker. Online Thank You card maker from Smilebox requires three things: a computer, an Internet connection, and a few moments of your time. That’s all it takes to customize and share a beautiful and free Thank You card. No matter if you are recognizing a huge favor or a minor good turn, we have a Thank You eCard maker to match. 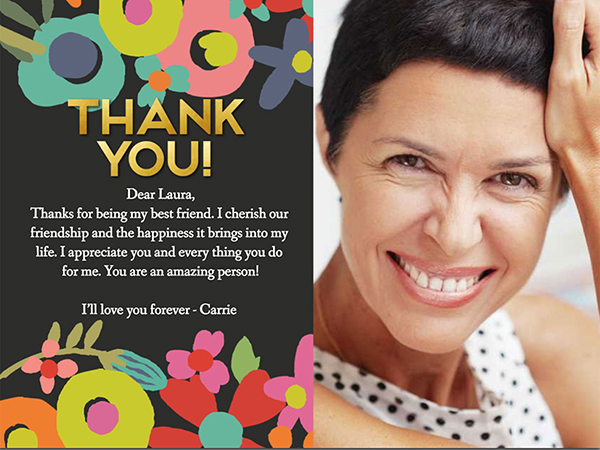 Thank You card maker from Smilebox lets you personalize every aspect of our free Thank You cards. Change the photo, main message, and colors in the online Thank You card maker with only a few clicks. Add music and other texts to get the fine details of your free Thank You card just right. Thank You eCard maker is also user-friendly when it comes to sharing. Email, social media post, saving to your computer, and printing are all at your fingertips. You can also deliver your free Thank You card with an impressive digital photo frame that makes an ideal presentation. Sound like a good deal? Keep reading to find out more! There are many ways to say “thank you,” and Smilebox covers nearly all of them with a large variety of online Thank You card styles. Pick your favorite, and then click “Personalize”. Thank You card maker provides generic images in its free Thank You cards so that all you need to do is change the text for the recipient. But if you have a photo of yourself – maybe with the person in question – then it’s easy to include it in your online Thank You card. Just click “Add More Photos” and follow the instructions. You can choose images from your social media account, computer, and phone, so that even your most recent selfies can be used in the online Thank You card maker. The Smilebox Thank You card maker was built to give you a wide range of customization options. Edit the text, colors, and fonts of your online Thank You card exactly the way you want. Make a last check of the details appearing in the online Thank You card and then hand it over. You can easily print the card at home using the Thank You eCard maker, or deliver it via email or social media post. The online Thank You card maker can be a surprising way to show your acknowledgement. Within minutes, you can refine the message of your online Thank You card to exactly express your feelings and flatter the recipient. And, because you use the Thank You eCard maker at home, you can ensure that your words and photo are just the way you want them to be. You might just be thankful for the Thank You card maker yourself! It exemplifies ease of use, choice, and convenience, all in a platform that you can use for all sorts of purposes. Free Thank You cards from Smilebox are the ultimate in choice. After finalizing your template in the online Thank You card maker, go ahead and share it in the most convenient way for you and the recipient. Thank You card maker provides a final version which is high resolution and can be printed in beautiful color at home.